SoPo Cottage: So What is Craftsman Style? And How Will It Get Incorporated In the Bungalow? 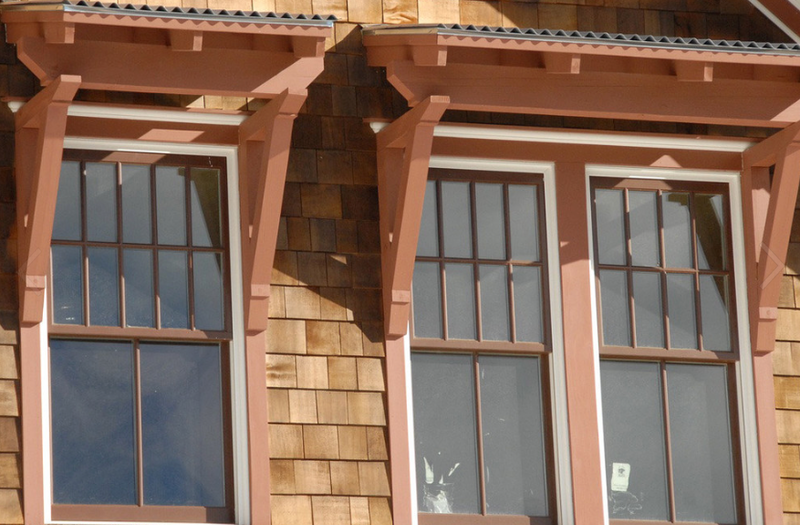 So What is Craftsman Style? And How Will It Get Incorporated In the Bungalow? Think about a Victorian style house. Lots of angles. Lots of ornamentation. Lots of complex details. In the late 1800's, that style started to fall out of favor with some new design leaders in England. A new movement, led by William Morris, began to emerge. They wanted simple, honest design - that highlighted the craftsmanship of their work. In the US, Gustav Stickley started his own approach to Arts & Crafts design. He created a magazine, called The Craftsman, that showcased a new house design in every issue. He also created his own workshop - Craftsman Farms - to create his furniture designs. In California, the Greene brothers created bungalows that are their interpretation of Arts & Crafts design. 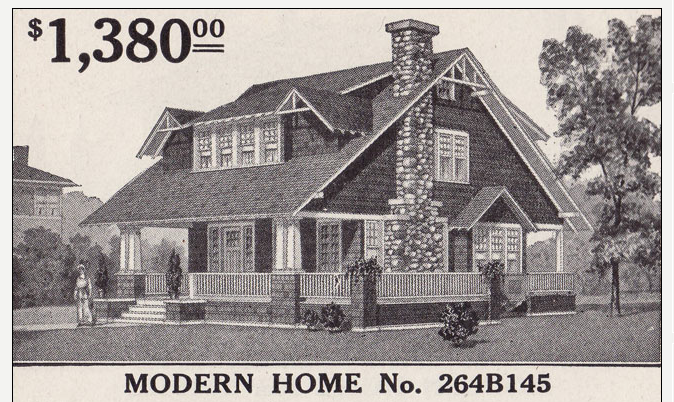 And as time went on, Sears started creating kit homes with Craftsman bungalow designs. So depending on what part of the country you live in, Craftsman can have a slightly different look, but there are some elements that they all share: natural materials, focus on craftsmanship, exposed structural elements, built in cabinetry, covered porches, shingle siding, etc. 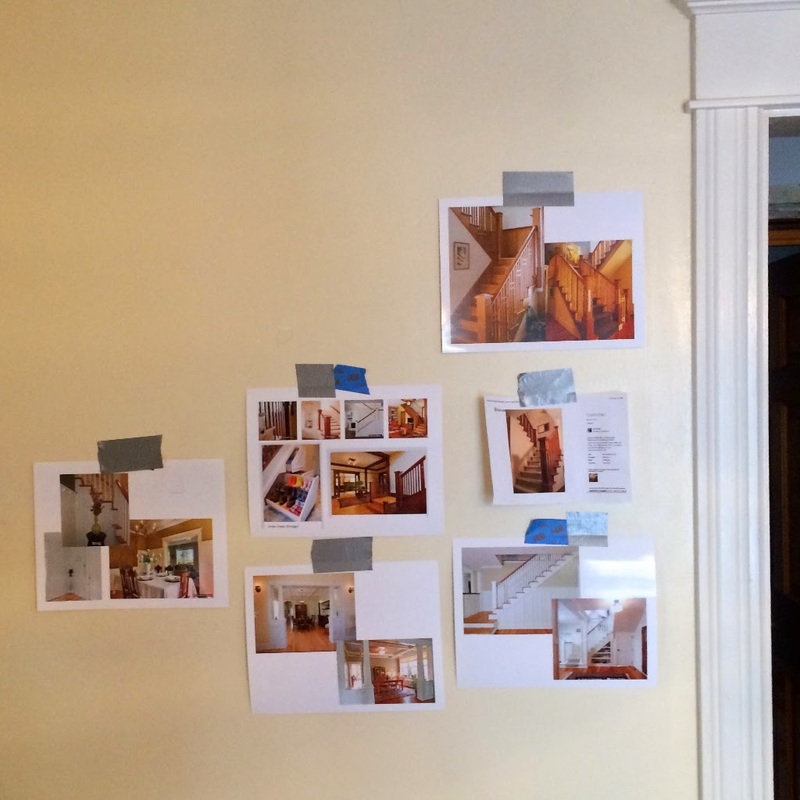 To help us start thinking through some of these elements, I created the 'Inspiration Wall' in the Dining Room. I printed out all the great ideas I've found online (Houzz.com is my favorite source) and taped them all over the walls. As we've mulled over the different project phases - design, demo and rebuilding - we've constantly referred to these photos. Colonnades - these colonnades, from an old Sears Catalog, are fantastic. They were in the 1921 Building Material catalog for $34. They are truly a classic and have an amazing resemblance to the ones we will build between the living room and dining room! 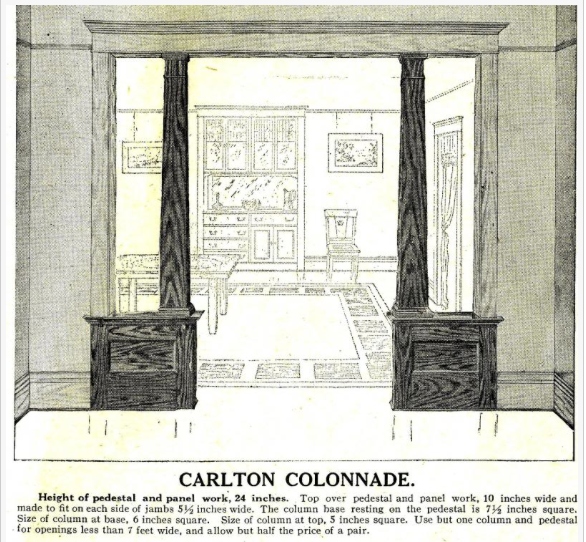 Cabinetry - See the built in cabinet behind the colonnades in the illustration above? We're going to create a built in hutch in the dining room, reusing a base from another house and creating custom shelving above. And we'll add lighting above the shelving, to really highlight the space. Staircase - You will certainly see a separate blog post about the staircase, because it's going to be the most dramatic feature you see upon entering the house. The design inspiration: this baluster design, it has me really excited. See the square pattern? We'll be repeating that pattern in other places throughout the house. Eaves & Exposed Rafter Tails - the nondescript front facade on our project is going to get a makeover with a Craftsman style porch roof overhang. It will be something like this, with broad eaves, chunky brackets and exposed rafter tails. 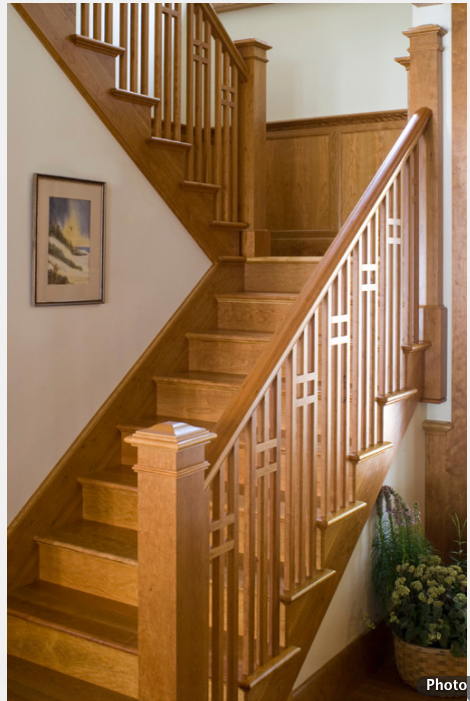 Do you have any favorite design elements of Craftsman style? I'd love to hear about them! And stay tuned as we get going and start to turn these ideas into reality! The old farm house I grew up in had similar colonnades like you've shown but there were glass front bookcases in bottom half. Years later after house was demolished, and after researching its floor plan, I discovered it was either a Sears Home (they came on railroads as kits complete right down to the last nail) or else a Montgomery Ward Home...much like Sears' idea. It was a very simple and rather small house. The inside had Craftsman elements but the outside was quite plain jane ;-) Clearly one of the less expensive models. Ah, it's so wonderful that you were able to figure out that it was a catalog home!! I bet it was so interesting to figure out what features people wanted to add when they purchased them. Probably like buy a car today! Beautiful transformation! My husband and I are planning to remove one wall to open up our staircase. I noticed from your after photos that both sides of the stairs match perfectly. I'm curious if you had install a whole new staircase or if you were able to match both sides based on your existing staircase? I ask because our GC is suggesting that we replace ours with a new one in order to match although I'd prefer to salvage the existing one. Thank you! We were moving the staircase to a whole new location - so we built it new! Before you tear out the old staircase, make sure you GC has worked through the rise/run requirements to meet building code. Sometimes, that can dramatically change the space the staircase will take up.